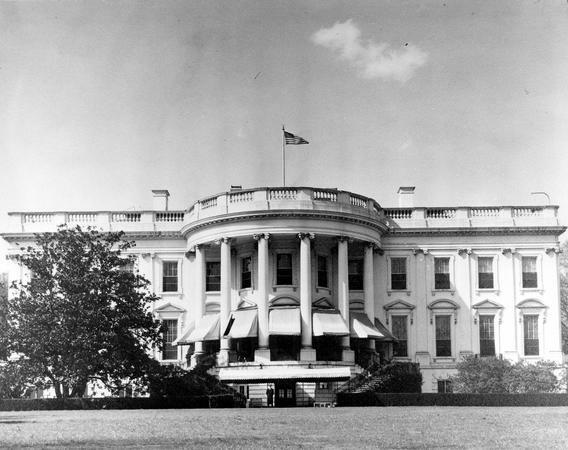 Early one evening in February 1946, Harry Truman summoned the White House’s chief usher to the second floor Oval Study. He pointed out the window through the South Portico to the Washington Monument and Potomac River beyond. “That’s a magnificent sight,” he said. Then he dropped his bombshell. 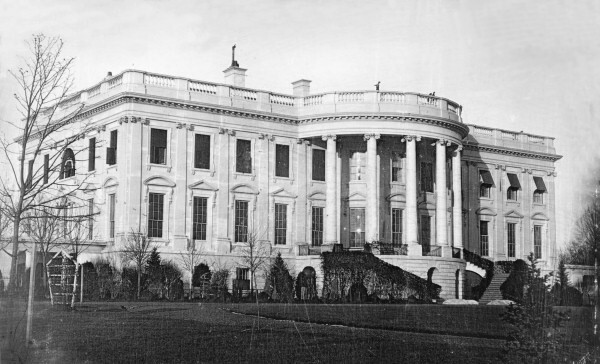 Simply put: presidents didn’t monkey around with the White House’s appearance. Period. Harry Truman was no fool. He knew his proposal would ignite a firestorm. So he had his arguments and rationale ready to share with Congress, the news media and the public. But he also had a deeply personal reason for doing it that he kept to himself. First, the experts were on his side. They said adding a balcony would make the mansion’s south front more architecturally pleasing. I’ll spare you their Archi-Babble. In layman’s terms, long vertical lines (such as the original six stone columns – which survived the Brits burning the place in 1814) look better when broken up by a horizontal line across the middle. Such as a balcony … wink, wink. Then there was the savings benefit. In the pre-air conditioning era, the mansion’s first floor sweltered during Washington’s tropical summers. So each year ugly canvas awnings were installed over the ground level windows to provide a bit of relief. Not only were they eyesores, they were also dust magnets. When the awnings were hauled down in the fall, they were so filthy they couldn’t be used again. Meaning a new batch had to be purchased every summer. By 1946, that was costing the government $20,000 a decade – more than $225,000 in today’s dollars. Adding a balcony would save Uncle Sam money in the long-run. Democrat Truman didn’t bother asking the Republican Congress for the $16,000 to fund the project, since “no” was a foregone conclusion. So he came up with the cash by making cuts to the president’s household account. 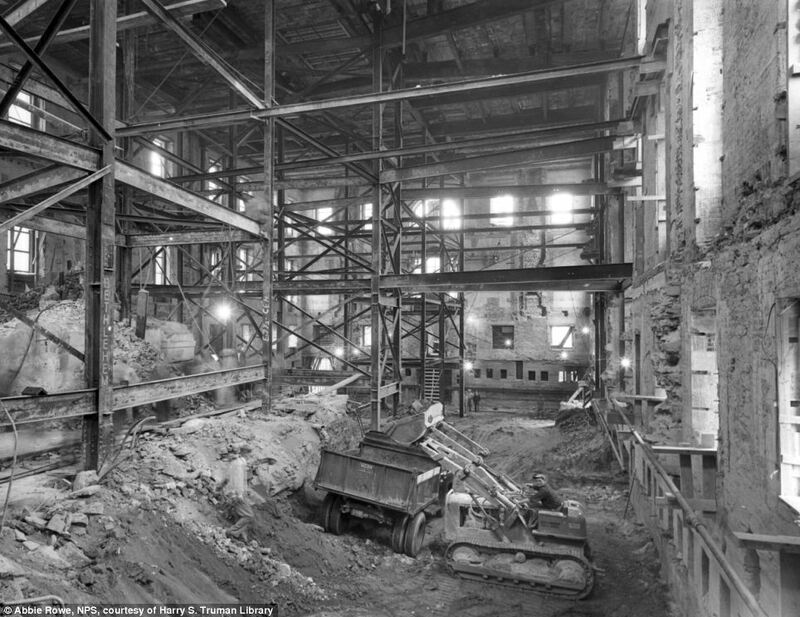 Then, in typical Harry Truman fashion, he built his balcony. When the fuss finally died down, even the critics grudgingly admitted it was an improvement. And the American people gave it a thumbs up. 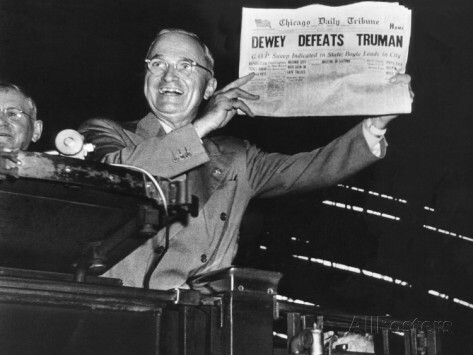 The balcony became so widely respected, in fact, Republicans jokingly “thanked” Truman for improving the house for the man whom they were sure would replace him two years later, Thomas Dewey. But as we all know, things didn’t turn out that way. The executive mansion was eventually gutted and completely rebuilt inside. One of the few features that survived intact: the Truman Balcony. It was so well-built, it wasn’t touched during the two-year renovation. 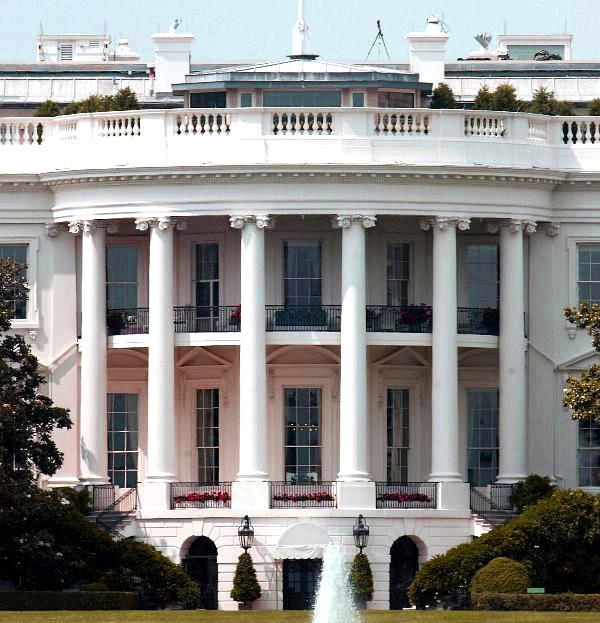 Eleven presidents have lived in the White House since Truman left it, and most agreed the balcony was one of their favorite spots. Besides providing one of the capital’s most impressive views, its breezy informality is a welcome break from the official stuffiness indoors. 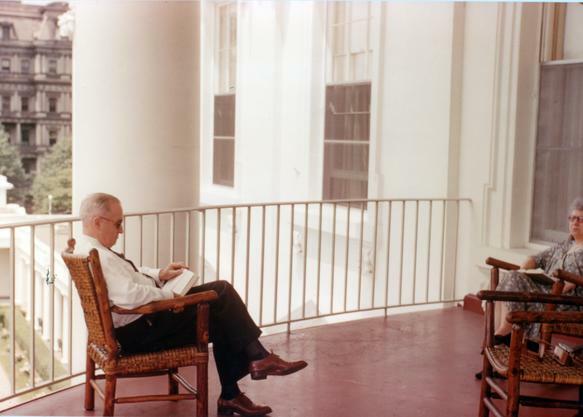 The Truman Balcony is, quite literally, the White House’s back porch. Which brings us to Harry Truman’s real, secret reason for building it in the first place. 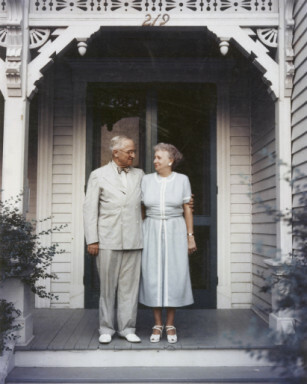 Truman’s passion for his wife Bess is one of the presidency’s greatest love stories. He fell in love with her the first time he saw her in elementary school in Independence, Missouri in 1890, and didn’t stop loving her until the day he died in 1972. He hated being apart from her. While Bess loved Harry in return, she hated the spotlight that accompanied the presidency. Though she admirably performed her duties as First Lady, she jumped at any chance to return to their home in Independence, where she spent the entire summer of 1945, leaving a lonely Harry pining for her in the White House. Their daughter Margaret wrote, “One of the chief pleasures of 219 North Delaware Street [the Independence house] was its porches, particularly the back porch …” where the family whiled away summer evenings “secure from prying eyes.” The Trumans sat there for hours, reading, listening to baseball on the radio (Bess was a huge baseball fan), and playing cards while Bess savored the privacy. Since Harry’s job didn’t let him share the back porch with his wife back home, he decided to bring the back porch to Washington. 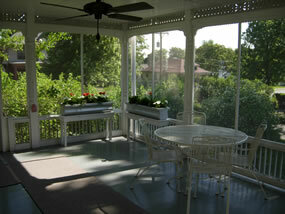 Harry Truman added the Truman Balcony in the hope it would lure his wife into staying with him during the summer months. Much as Bess appreciated the gesture, and genuinely liked the new balcony, it wasn’t the same as the one at home. And nothing, nothing at all, could overcome her burning desire to flee Washington, with or without her husband. The summer of 1946 found her back on North Delaware Street. Harry Truman wasn’t the first husband to make a bold gesture in an attempt to keep the Missus happy. And he wasn’t the first to experience an Epic Fail as a result, either. But it’s a good thing for all of us he tried. This entry was posted in American history and tagged Harry Truman, Truman balcony, White House on April 23, 2016 by admin.